The International Monetary Fund (IMF), assessing the pace of the Ukrainian economy in 2019, projects that the average annual hryvnia exchange rate would devaluate to UAH 28.655/$1. In the World Economic Outlook issued in October, the IMF predicts that nominal GDP of Ukraine in 2018 would grow by 14.7%, to UAH 3.421 trillion, in 2019 – by 11.33%, to UAH 3.809 trillion and in 2020 – by 11.42%, to UAH 4.244 trillion. In U.S. dollars, nominal GDP of Ukraine is estimated at $126.39 billion in 2018, $132.928 billion in 2019 and $141.824 billion in 2020. According to the National Bank of Ukraine (NBU), the average hryvnia exchange rate since early 2018 has been UAH 26.99/$1. 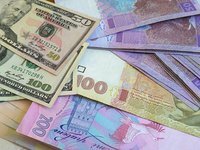 In July 2018, the Economic Development and Trade Ministry published the forecast for the social and economic development of Ukraine in 2019-2021, based on a smooth devaluation of the hryvnia – by no more than 3.2% per year, or to UAH 30.7 per U.S. dollar (plus or minus UAH 2) by the end of 2021.